The Carrickmacross Town Public Realm and Economic Plan Project Team and Monaghan County Council would like to thank all those who came to the first Public Consultation Workshop held on the 6th March at The Shirley Arms Hotel. 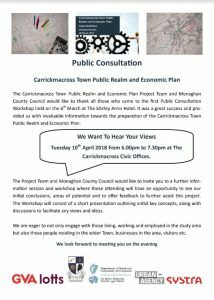 It was a great success and provided us with invaluable information towards the preparation of the Carrickmacross Town Public Realm and Economic Plan. The Project Team and Monaghan County Council would like to invite you to a further information session and workshop where those attending will have an opportunity to see our initial conclusions, areas of potential and to offer feedback to further assist this project. The Workshop will consist of a short presentation outlining initial key concepts, along with discussions to facilitate any views and ideas. We are eager to not only engage with those living, working and employed in the study area but also those people residing in the wider Town, businesses in the area, visitors etc. We look forward to meeting you on the evening. Meeting takes place on 10th April at the Civic Offices in Carrickmacross.